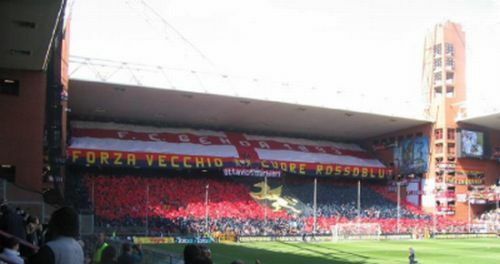 Because of the (little) problems after the match Genoa-Fiorentina the authorities decided that Genoa-fans could only buy 1 ticket themselves to visit the match in and against Siena next Sunday. It is also not possible to sell your ticket to someone else. No problem for at least 5.000 Genoa-fans that already bought a ticket to visit the match in the beautyful Toscany-city 307 kilometers from Genova. In the meanwhile the victim of the playerscoach of Fiorentina, Gabriele Amato is operated twice and gets better every day. Since the return of both teams in Serie A four times Genoa and Napoli played against each other and our Rossoblu-boys did win alle 4 matches. 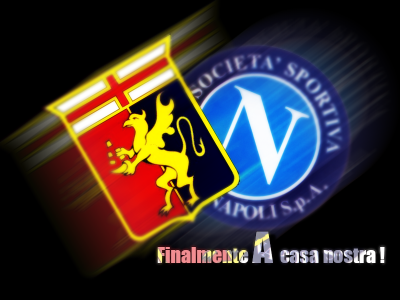 Last year the results were 1-2 in San Paolo and 2-0 in Genova and this season Napoli was beaten by 3-2 in Luigi Ferraris and 0-1 today. While Napoli was the team with the most ballpossession today, Genoa created the 3 biggest chances. In the first half Milito was stopped by goalkeeper Navarro of Napoli, who als saved a great header of Jankovic just before the end. The only goal was made by substitute Bosko Jankovic who beat Navarro after a fantastic assist of Thiago Motta in the 69th minute. After the last whistle of referee Orsato the Napoli-fans clapped their hands to the Genoa-players while they screamed against their own trainer and players. The same thing happened outside the stadium: the Genoa-players got compliments of the Napolitans when they stepped into the coach, while the Napoli-players could not leave their dressingroom that was blocked by unhappy supporters. With this victory Genoa stays 5th in the standings while Mutu of Fiorentina again scored a very dubious winning goal in the 94th minute. An investigation of Lega Calcio should start. Today our loved President Enrico Preziosi celebrates his 61st birthday. 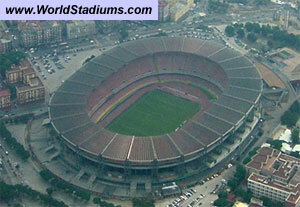 In April 2003 the Joker (nickname of Preziosi) bought Genoa C.F.C. of Luigi Dalla Costa just before the club would be bankrupt like Dalla Costa himself. For saving Genoa we already honoured Enrico as Genoa Club Amsterdam Genoano of the season 2002-2003. Since the match Genoa-Venezia in June 2005 Mr. Preziosi is officialy banned out of football for 10 years, but in fact he still is our President who takes care of the return of Genoa to the top. Yesterday Enrico Presiozi organized a big press-conference to tell his story about the dramandous accident with Gabriele Amato after Genoa-Fiorentina. Before the accident happened Preziosi asked many supporters to leave the exit of the Stadium and most of them listened. In the future our President wants a better behaviour of our players and supporters versus the opponent and he wants more Genoa-attention of the press. 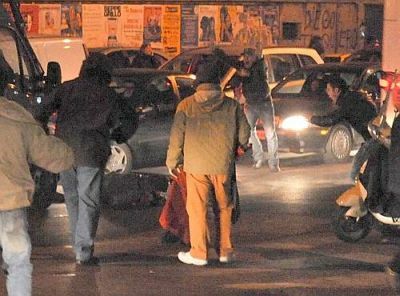 The fact that 2 Genoa-supporters were wounded by knives of Roma-fans also has to be in the newspapers who always save the big clubs in and outside the field. Mr. Preziosi also told that he’s sure that referees like Rocchi (Roma-Genoa) and Rizzoli (Genoa-Fiorentina) make errors because everybody makes mistakes and not because they want to help the big teams or want to punish the “little” Genoa. At the moment Preziosi mentions that referees disadvantage Genoa or that Genoa supporters get violent he immediately stops with our club. We all know what this will mean to Genoa and our fantastic Serie-A team. Happy birthday Enrico, we hope to stay together for many, many years ! Immediately after the last whistle of referee Rizzoli a few seconds after the equalizer of Mutu (3-3) all Genoani protested furiously. The players in the field, but also the supporters everywhere in the stadium. After the dubious decisions of referee Rocchi last week in Rome now it was too much. Again Genoa got a very dubious (and early) red card, because the second yellow card of Biava was given very easily by Rizzoli who refused to give Fiorentina-player Jovetic his second yellow card later in the match. Also the penalty of Fiorentina was dubious and the goal 2 seconds before the end was regular but very painfull to the 10 Genoani that played a fantastic match and deserved the 3 points. Two hours after the match the Fiorentina-coach finally got permission of the police to leave Luigi Ferraris Stadium after Genoa’s president Enrico Preziosi himself had send home most of the Genoa-supporters that wanted to wait till referee Rizzoli would show up. The playerscoach of Fiorentina was the first object that showed up after 2 hours of waiting and the 150 supporters reacted furiously, but of course couldn’t do anything else than touching the coach with their hands. Also Gabriele Amato touched the coach with his hands but dramaticly he came under the wheel of the playerscoach. Now 29 hours later Gabriele’s life is still in danger. A horrible end of a fantastic match that should stop 5 seconds earlier. Hold on Gabriele, keep strong !! Three seconds before the last whistle of referee Rizzoli the 10 of Genoa (red card of Biava in 30th minute) still had the lead by 3-2 but our tired defenders could not kick the ball far away of their own goal any more. Everybody counted the seconds of the 3 minutes injurytime till after 2 minutes and 58 seconds Mutu scored his and Fiorentina’s third goal: 3-3. There was not even time to take the kick-off any more. For a moment the many suffering years in Serie B and especially the horrible matches against Piacenza and Mantova came back in the mind, but now a few hours after the match we can only be proud that our boys played over an hour with only 10 players fantastic football and scored 2 times against a topteam like Fiorentina. Of course we had to win, but if we play like this it will not be a problem to reach European football. Genoa started the match with Rossi and Mesto in the team, who both had a role in the first 2 goals of Genoa. In the 12th minute Marco Rossi passed the ball towards Motta who had a perfect combination with Milito and scored the opening goal. In the following 18 minutes Giuseppe Biava got 2 yellow cards, so Genoa had to play the rest of the match with 10 players. The sadness lasted only 8 minutes when Palladino scored a cross of Mesto who first had a fantastic run of 70 meters with the ball: 2-0. Halftime. Also after the break the 10 Genoani were at least equal to the 11 Fiorentini. In the 56th minute Criscito was irregulary stopped in the penalyarea and Milito realized the penalty: 3-0. Match over ? Unfortunately not, Mutu first scored a penalty in the 59th minute, a free kick (that was touched by Motta in the wall) in the 80th minute and the last one in the 93rd minute: 3-3. After the defeat of Roma we are now alone on the 5th place with 41 points, 1 behind Fiorentina. Next week we play in Napoli without Biava and Juric. Today we play against Fiorentina, the team that is since last week 1 point ahead of us. We now immediately have the chance to put the Toscanies back were they belong: below us. Also in Holland the match will be followed with special eyes because later this week and next week Ajax plays against Fiorentina in the Uefa-cup.